The San Antonio Zoo is now home to a heartthrob. Haley, a 25-year-old female American bald eagle shot in the wing in 1998, was deemed non-releasable by the U.S. Fish and Wildlife Service and has lived in a number of zoos since her injury. She spent 30 days in quarantine after leaving the Santa Barbara Zoo and is now the star of her own popular exhibit in Texas. 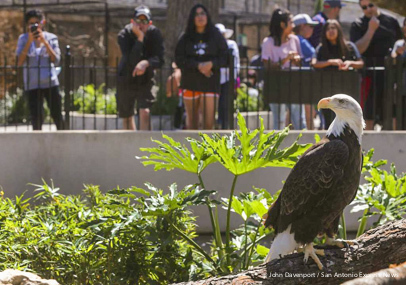 Haley’s the first eagle at the San Antonio Zoo in a decade, but she won’t be alone for long. A male eagle, Chinook, will soon be introduced to Haley after his arrival from a Washington state zoo. The fungus that causes deadly white-nose syndrome in hibernating bats has been detected in Texas for the first time. The syndrome has killed millions of bats in the eastern parts of North America, raising national concern. A coalition of groups in Texas is continuing work to monitor the spread of the problem and is seeking willing landowners who could help scientists locate and access bat caves. The fungus, Pseudogymnoascus destructans (Pd), was detected on species of hibernating bats in six North Texas counties: Childress, Collingsworth, Cottle, Hardeman, King and Scurry. The three species are tri-colored bat, cave myotis and Townsend’s big-eared bat.